I thought it would be fun to go backpacking for a weekend.Â I’ve always wanted to check out the Land Between the Lakes (LBL), so I started planning a trip over the long Fourth of July weekend to backpack at LBL. The plan was to hike in, camp, hike, camp, hike out. We stuck to the plan and all things considered walked away with a few good memories.Â Saw tiny frogs, had a nice camp site, and toured the bison reserve. One of a bazillion tiny frogs we encountered. 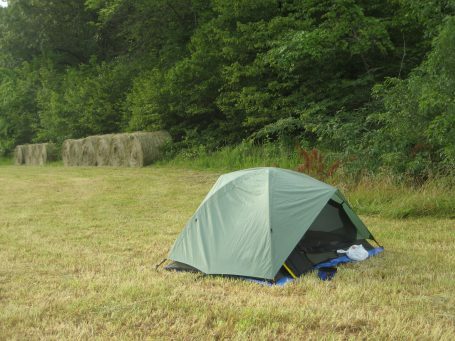 Campsite on the edge of a freshly cut field. Pablo liked the spot. 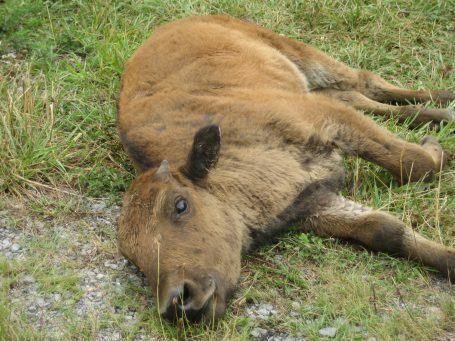 Baby bison on the reserve. Pablo was definitely curious about the creatures. But we had our share of difficulties. The insane amount of spider webs strung across the hiking path was fixed easy enough with a waving stick held by the leader.Â Our spur of the moment decision, early our first full hiking day, to add a loop to our planned hike made the end of the day really tiring but made us more determined. The strong thunderstorm late in the evening the second night, that lasted most of the night, didn’t dampen our spirits much.Â But the mosquitoes, ticks and chiggers tried us mightily and nearly broke us. My fearless, spider-web catcher husband and his trusty, side-kick, tick-collector dog. We stopped about a mile into our hike the first night and discovered ticks on our socks and legs.Â This led to a tick check each and every water break.Â Poor Pablo had to of been tired of us poking and pulling at him.Â He was attracting TONS of ticks. The mosquitoes were just a general annoyance.Â But the chiggers were sly, we didn’t realize their presence until the second night camping.Â They might be little but they cause a BIG itch. So Peteifer and Pablo decommend the LBL in July for backpacking.Â Stick with the water adventures friends, your skin will thank you. 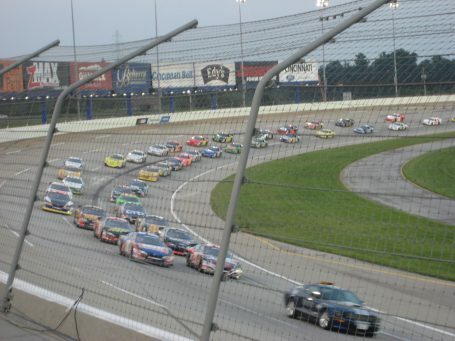 So Peter and I attended a Nationwide Series race at the Kentucky Speedway this summer. 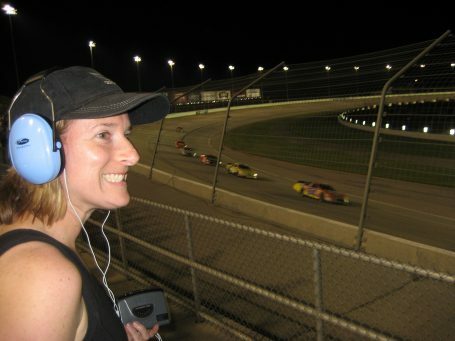 If you are not super familiar with NASCAR, it was like watching a minor league baseball game. We had a blast! The first time the cars came around the turn heading to a green flag just took our breath away. Heading around turn four to the start. The wind, the dirt and grit, and the noise. You just have to experience it for yourself. The race went well into the evening. The winner of the night – Joey Logano. During our recent Europe trip, we decided to hop on over to Whales, since it’s so close to Bristol. What we hadn’t accounted for was how big of an adventure it would be. Be warned this is a very long blog post. The pictures and captions make for a great quick version. “I guess it is about time for us to get back to the bus station,” I said glancing at my watch. “Instead of taking the sidewalk, I bet we can take this path,” Jen responds. We had spent the last couple hours exploring the Chepstow Castle, admiring the view of the river and cannon ball damage. Next on our schedule was a bus ride to ruins of Tintern Abbey. We visited the Chepstow Castle in Wales. We begin down the path and there is a tourist information sign, the type that is along thousands of paths the world over. Having a propensity to read signs, my wife waits so I can see what is has to say. The sign is a map that shows the castle with a “you are here” arrow pointing to it. Also on the map is Tintern Abby. 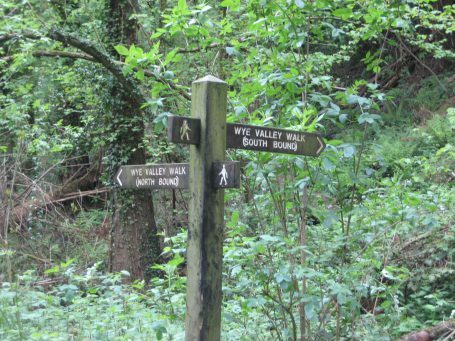 Connecting the two is the Wye Valley Walk. We stop in at the tourist info center 100 meters away and ask for more information about this “walk”. We saw a sign (similar to this one) and thought, that would make a nice hike. Jen and I are usually up for a good hike. 5.5 miles isn’t too far, especially since we know we can take a bus back. We head down the black asphalt road, it’s not yellow and not brick, but it will do. We walk by the castle, then past a school, which is letting out. On our way out of town we see a sign marking the ‘diversion.’ What we in the U.S. would call a detour. Of course I stop to look at the sign, and while there is no “you are here” printed on the monocrome map, it doesn’t take much to identify our current location. We follow the route and head out of town. We pass through a wooded park. Ahh, another sign. “It looks like we’re supposed to go straight through the field,” I announce. Jen confirms, “yep, looks like it.” We proceed through a small gate, over a hill and see something we have never encountered on a trail before: sheep. Our hike took us through a sheep pasture. This is just too cool. So we decide to enjoy the sheep pasture for a little longer and have a snack. We are clearly on someone’s farm. 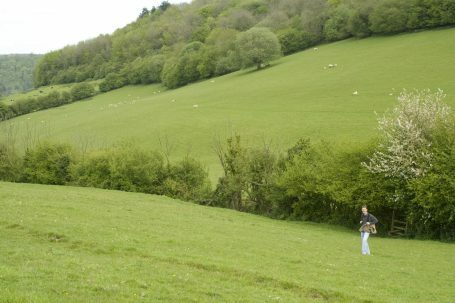 We had heard that in the UK public walking trails cut right through private farms. The path is very obvious, after our snack we continue down it. We come to the end of the field and enter some beautiful woods. We hike along a ridge overlooking the river. Such a gorgeous hike, and it is not crowded at all. We haven’t seen anyone since we passed the school. As we come out of the woods, another detour map. Yep, we’re still on the right path. “Looks like we need to do a little zig-zag and cross the road,” I announce. We do and find ourselves walking along, and on top of, a field of 3 inch high sprouts. We both attempt to tread lightly, hoping we don’t damage much of some farmer’s crop. Each stage of the hike has taken us through different terrain. We know the detour ends at about the half way point. Almost two hours in, it feels like this might be longer than a five and a half mile hike. We find the end of the detour, which is conveniently at a picnic and parking area. We take in our backpack full of “energy,” a term that makes “calories” sound so much more appealing. Half way through our hike we stopped for a picnic overlooking a valley. Now where to from here? The picnic area contains a couple signs we investigate nearly a dozen times, between the two of them and the two of us. We wander off in what must be the right direction. At the top of “365 steps” we find our first flying salmon since lunch. “I think we took the long way up the hill” says Jen. “The diversion does seem like it is marked better than the regular trail,” I conclude. No use complaining, we’re at the top of the hill and walking through a forest. This forest is the kind of seen in movies. It is filled with the brightest greens that have ever made their way out of a children’s book. We walked through this beautiful green forest after hiking up 365 steps. We continue along, spotting small flying salmon marking every few hundred meters. Keeping an eye on the time, we have to be getting close now. The forest ends, and we’re in another field. More sheep! On to a step, and over a fence, and now cows. Awesome, picturesque black and white cows. They’re curious and we’re having a blast. 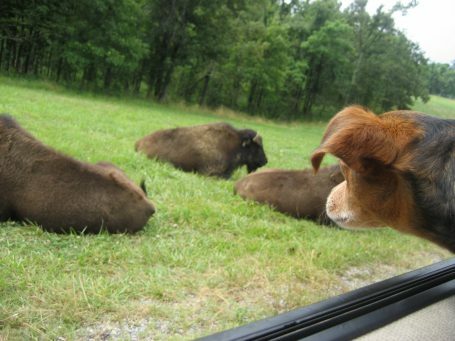 This is not something we see when hiking close to home at the Red River Gorge. 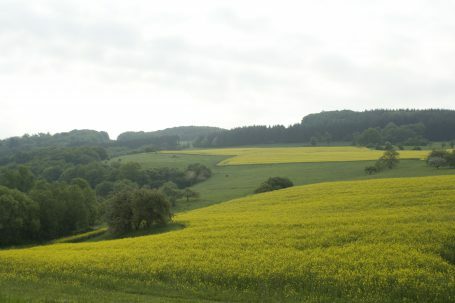 The trail went through fields and pastures, clever steps let humans cross but kept livestock in. I'm not sure what the cows thought of people just walking through their field. We see a sign post in the distance. Crossing the dry creek bed it takes only a couple minutes to reach it. It is at the intersection of a little one lane country road and the path we had been on. There are a couple wooded arrows. One pointing towards a church, but no mention of the abbey ruins, which are our destination. Without any reason to think otherwise, we continue walking in the same direction. We keep any eye open for any fence crossings or other path markings. I’m starting to think, I really wish that sign mentioned the abbey. We find ourselves among more cattle, not as picturesque as the previous herd, but still cool. Neighboring the cows is the church that was mentioned on the sign. This country church is not the abbey we were looking for. This doesn’t happen to be the one Sunday a month when the church is in service and there is no one around. The information board by the church has a crude map. It marks the path we are on, an arrow mentioning the abbey and an arrow towards the church parking area, up over the hill. Oddly, the arrow pointing to the abbey and the path on the map don’t go in the same direction. “Do you see a path through that field?” I ask Jen. “Not that I can see” is her response. “Okay, you go around the fence, looking for a path marking, and I’ll go straight through the field.” We set out, but there is a bull staring me down. Suddenly, joining Jen along the fence doesn’t sound like a bad idea. After a 5 minute walk we reach the other side. Nothing, not a fence crossing, not a sign, not a trail marking. Maybe I miss read the map at the church. Considering we didn’t actually have a map, we head back to the church’s map. No new clues are revealed. “We should head the the parking lot,” the tired version of myself suggests. Up the hill. The parking lot is on another little one lane road. After standing there for 5 minutes we realize there is not a great chance of anyone passing by anytime soon. As the day becomes later and our energy wains, we realize that we might be lost in the middle of a foreign country. We can’t really go back the way we came, we left nearly 5 hours ago. We say a little prayer by the church and decide to head back to the arrows where the path crosses the first little road. There are some barns and we can see a pretty good distance. Worse case, we follow the road for a while until it comes to something. As we near the road, we see an old man and a dog come and sit down. We haven’t seen anyone since the green forest. An answer to prayer, someone to ask for direction. His dog is excited to see us and makes for a natural conversation starter. (This way we don’t seem too desperate or too lost.) 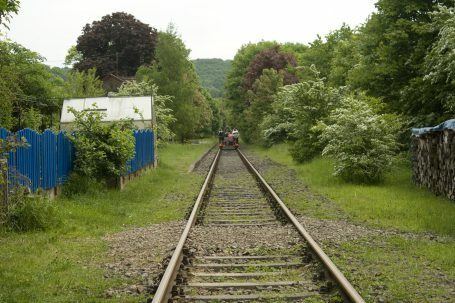 I mention, “We were headed to Tintern Abbey but seem to have lost our path.” He replies with the accent you would expect from an old man in the-middle-of-no-where Wales, “Ah, yes. You came off the path a while ago. The easiest way to get there would be to go back down this hill, and follow the valley to the left.” “The creek bed?,” I ask for clarification. He reiterates. That is the way we’re supposed to go. We arrive at the dry creek bed and follow it to the left. We praise God for giving us someone to point us in the right direction. 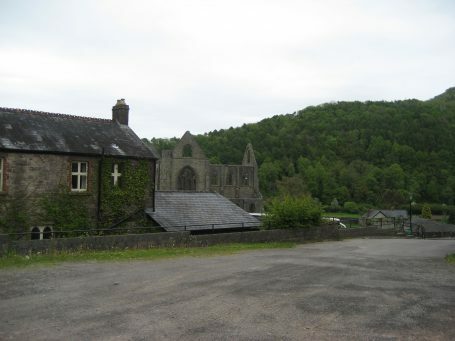 To get back to on track for the Tintern Abbey we should take the left valley. With smiles returning to our faces, we hear a weird sound up ahead. It gets louder as the source comes into view. It is the thing we would least expect to see at this moment. We see a dirt biker enjoying the challenge of the rocky valley. Wanting to make certain I understood our friend, the old man, correctly, I ask if we’re headed the right way to the abbey. He responds over the noise of his idling dirt bike, “Yes, just follow this for about a mile.” In just a few more minutes we see a trail sign. If we had taken the right path, we would have seen this sign over an hour ago. “So it looks like we should have gone straight instead of taking a left,” Jen states as we piece together what went wrong, “but didn’t we see trail markers?” At this point it all starts to come together. We saw plenty of trail makers, taking us through the the cow pasture, and up to the church, but they weren’t flying salmon trail markers. Now we are on the right path. The tree covered creek bed ends behind an old building. Making our way around we see the abbey. I see the bus stop in front of the abbey and glance at my watch. “We just missed the bus.” We didn’t have a map of the hike, but we knew our planned bus times. After hiking for 5 hours we finally saw our destination, Tintern Abbey. The guy in the gift shop confirmed the bad news. The next bus didn’t come for a couple hours, but they did sell ice cream. At this point we were in no mood to look at the abbey, so we just waited and enjoyed some ice cream and cold water. “I’ll meet you at the bus stop,” I said to Jen as I headed towards the restroom. Nearly two hours had passed and we were ready for our adventure to be over. When I got to the bus stop there were two people waiting. One being my wife, and the other, being a guy in his late 50s or early 60s talking to her. His accent is heavy, and while we can’t understand everything, we gather that he once lived in this town. He liked to talk, but wasn’t much of a conversationalist, he also hadn’t been to the dentist recently. We definitely weren’t late for this bus and as we saw the old clunker of a bus come down the road, I was secretly hoping our new “friend” wasn’t going to keep us entertained for the 20 minute bus ride back to Chepstow. I said earlier it was getting late in the day. Let me remind the reader, that this is “late in the day” by little-town-in-Wales’ standards. It was only 5:30. Bus stations, even un-manned ones are a hub of transportation. A taxi stand nearby had a cab or two waiting for a gig. I walked up to the nearest taxi and ask the driver how much a trip to Bristol would be. I was hoping it would be cheap, but by this point we didn’t have a lot of options. “Um, to Bristol? About Â£35,” was his response. Since the two middle aged ladies were also in need of transportation to Bristol, we split the fare. Walking our bike across road crossings and someone had to jump out and lift the barrier. 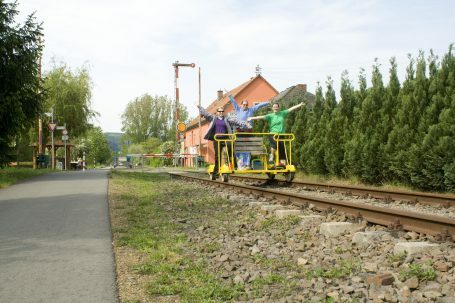 So lots of people were just pedaling down the tracks. If you happened to stop and wanted to take the pedal bike off the tracks – lift with your legs – those bikes are not light by any means! We biked through several little towns.Â Leaving Erdesbach according to the above sign. It really was a nice way to see the country. And we almost got through the day without getting rained on, but the last several kilometers were in the rain so we used that as an opportunity for some 1 km time trials! Thanks for the great day Kris!